It's 1873 Arizona. We have a mysterious loner named Jake Lonergan (Daniel Craig) who can fight three or four men and win. We have a typical Western town called Absolution. We have the rich mean Colonel Dolarhyde (Harrison Ford) who owns just about everything and runs the town. Then there's the saloon and the beautiful woman Ella (Olivia Wilde) Lonergan meets and falls for. And finally, well, we have aliens. Yep, nasty, ugly, slimy aliens who are up to no good by blowing up stuff, kidnapping humans and stealing gold. This is a Western with horse-ridin', six shooters, tobaccy spittin', whiskey drinkin' and oh, did I mention aliens? When I first heard of this film, I laughed. Who would have ever thought of putting those two genres together: a Western and science fiction? Was I right to imagine a guy sitting around with a "dart board of film genres" aimless firing away at the wall until a random sequence of two darts sparked his imagination? George Lucas presents Star Western. Actually, the mixing of science fiction and the Western is not at all unheard of. The "Space Western" takes the themes of a Western and transposes them to a science fiction setting. A "science fiction Western" starts with a regular Western and adds science fiction elements. I suppose the first, Space Western is probably the better known of the two but the second does have good company as none other than Stephen King himself has written a series of books called The Dark Tower which are considered science fiction Western. Nevertheless, this film is going to be a first for a lot of people including myself. The bigger question is whether it works or not. Having just seen the film, I can say I enjoyed it but I also think I see why the film would have only wound up with a score on Rotten Tomatoes of 44%. Don't forget that score is an average of the rankings handed out by major movie critics. As a Western, the film is excellent. The acting is top notch; the settings, the town, the costumes, etc. are all just superb. The beginning when the aliens show up and our cowboys are pitted against an obviously superior force is still "Western-y" and fits in quite well. I guess it's the final part, the ultimate fight scene with these extra-terrestrial monsters when things seem to not live up to the fabulousness of the first part. One critic had a point when he said he would have enjoyed watching the director and the cast just make an ordinary Western. That part of the movie seemed far more interesting than the out-of-the-world space creatures raining terror down on the hapless citizens of Absolution. I read Roger Ebert's review with amusement as he closed with, "Note: Oh, blessed joy! The movie is in glorious 2-D." I must admit that I shelled out the extra three bucks to see Captain America: The First Avenger in 3D and walked away thinking that the 3D didn't add anything to the film experience at all. Mr. Ebert frowns on 3D as a dumb "gimmick" and I'm beginning to think he's right. After all, a good story needs no gimmicks or special effects and when I think back on the true stinkers I've seen, the lack of a good story was at the heart of my disappointment. These days there is a lot of craft in making a film and much of that craft is top notch. To fail means you just don't have a good tale to tell. I believe the film deserves a better score than the 44% of Rotten Tomatoes; at least 60%. Okay, it's not a great film, but it is a good one and a unique one at that. Now how many times in your life can anybody brag they have seen a Western film with aliens in it? Hey! That in itself was my ticket into the theatre! All in all, it was a well made piece of cinematic craft. Yes, it wasn't a highfalutin art film but I enjoyed it. Daniel Craig and Harrison Ford are as dependably appealing as ever, but they're let down by director Jon Favreau's inability to smooth Cowboys & Aliens' jarring tonal shifts. 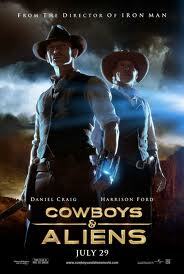 Cowboys & Aliens is an American science fiction Western film starring Daniel Craig, Harrison Ford, and Olivia Wilde. The film, directed by Jon Favreau, is based on the 2006 graphic novel of the same name created by Scott Mitchell Rosenberg. Cowboys & Aliens was released in the United States and Canada on July 29, 2011 and in other countries on ensuing weekends. Cowboys & Aliens is a 100-page Platinum Studios 2006 graphic novel created by Scott Mitchell Rosenberg and written by Fred Van Lente and Andrew Foley, with penciler Luciano Lima. Space Western is a subgenre of science fiction, primarily grounded in film and television programming, that transposes themes of American Western books and film to a backdrop of futuristic space frontiers; it is the complement of the science fiction Western, which transposes science fiction themes onto an American Western setting. A science fiction Western is a work of fiction which has elements of science fiction in a Western setting. It is different from a Space Western, which is a frontier story indicative of American Westerns, except transposed to a backdrop of space exploration and settlement. And now for a few miscellaneous notes which may or may not be directly linked to this film. I first noticed this actress in the television series House where she played the doctor Thirteen. Now, she seems just about everywhere. Tron: Legacy in 2010, The Next Three Days in 2010 and two other films scheduled for release in 2011: The Change-Up (Aug) and In Time (Oct). This is one busy woman. Like me, you may be a James Bond fan so I had to throw this in. Bond 23 goes into production in late 2011 and the release of the film is currently scheduled for November 9, 2012.